A new take on an old motto: Obedientia Civium Urbis Felicitas | Come Here To Me! « Here’s to you, Niall Hannigan. Not so long ago, we looked at the chains of the Lord Mayor of Dublin on the website. Readers of the blog might have been surprised to learn that King William of Orange is depicted upon the ceremonial chains,and it was hoped that “in everlasting memory of the great services of William III to the Protestant inhabitants and as a mark of his royal grace and favour” he would bestow the chains upon the city. 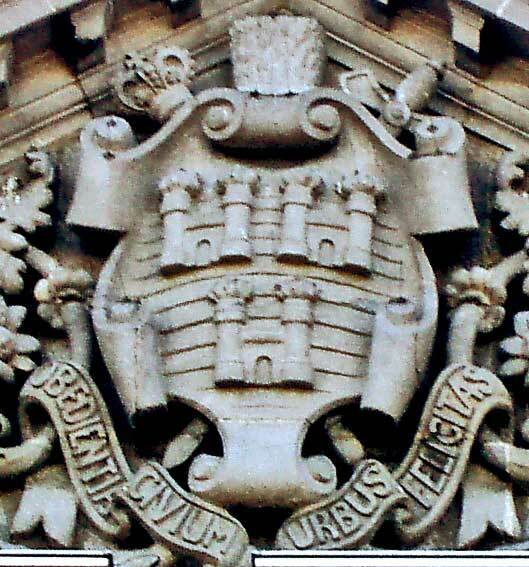 But if King Billy is out of place in Dublin, so too is the city motto: Obedientia Civium Urbis Felicitas. Translated, it essentially proclaims that the happiness of the city depends upon the obedience of its people. 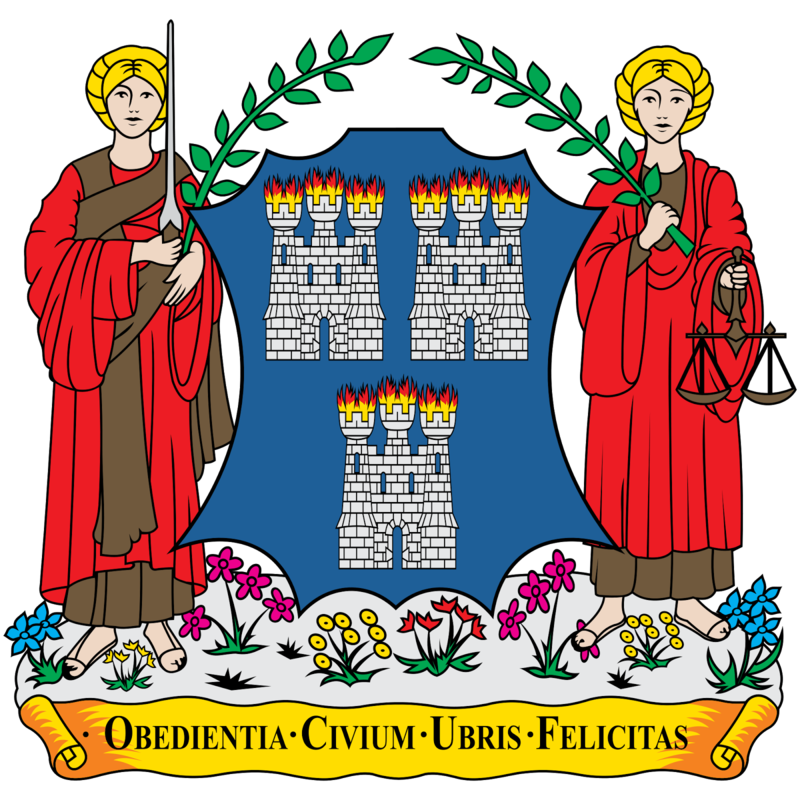 It has been argued that the flames depicted within the city coat of arms represent “the zeal of the citizens to defend Dublin”, though looking at the course of Irish history the zealof the citizens to destroy Dublin may seem more fitting! 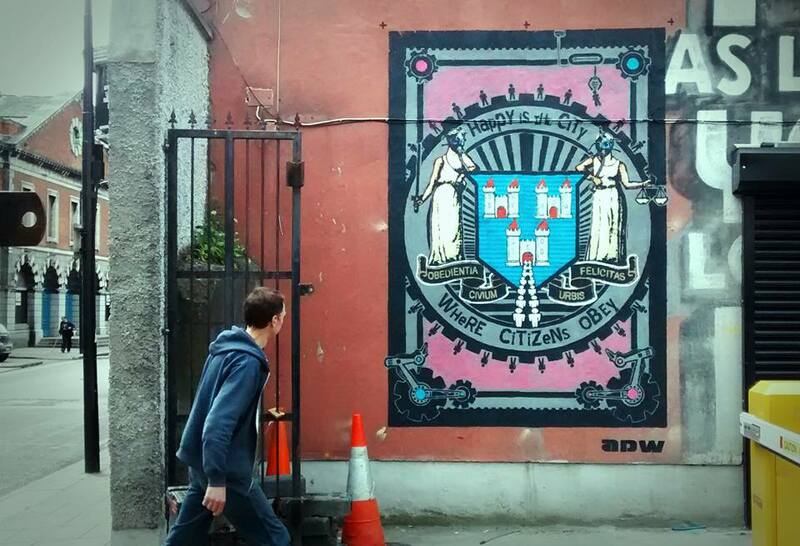 Recently, Dublin street artist ADW had a bit of fun with the city coat of arms as part of the All City Tivoli Jam, which sees the walls at the Tivoli Theatre carpark redecorated on an annual basis. ADW’s art may be familiar to some readers of this blog, for example his redecoration of a dull city centre powerbox. ADW has taken the coat of arms and placed the people of the city within a turning cog of a machine. Justice and Law still feature! As a work in progress. 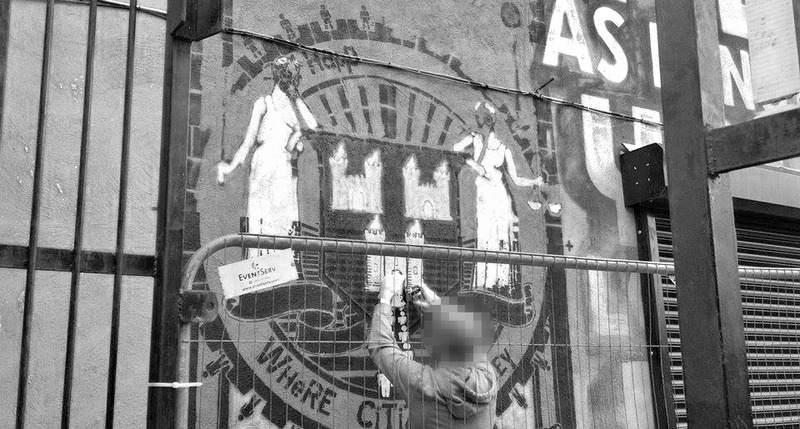 Variations of the city coat of arms are to be found all over Dublin today, on street lamps and above buildings. 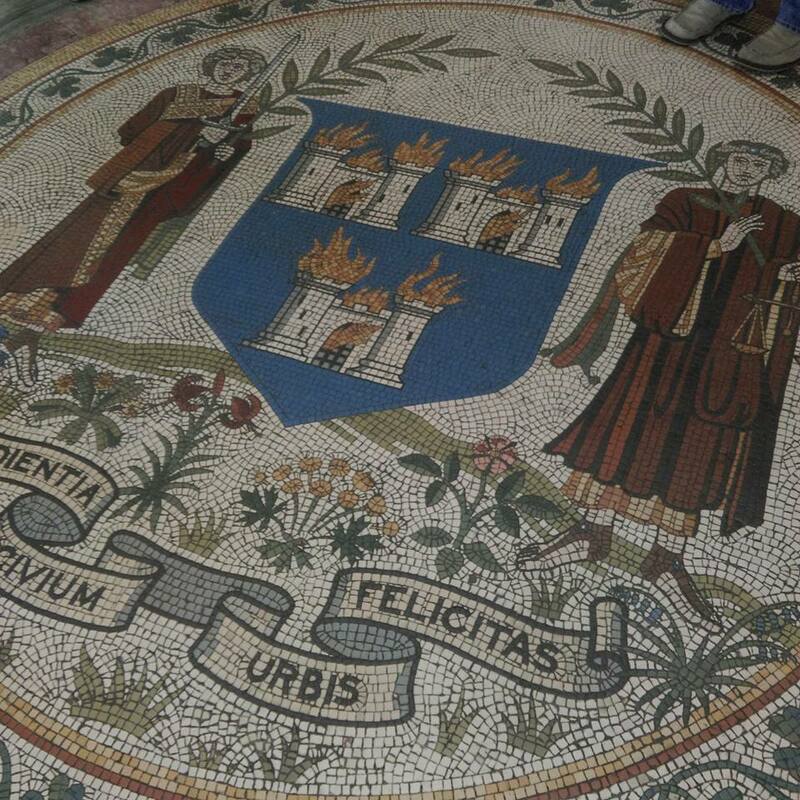 You’ll find a beautiful mosaic tile in City Hall which is well worth taking the time to visit. While you’re there, check out the murals around it. Do I see some [h]ubris in the first illustration. And then there’s this one at Pearse St. library. on August 20, 2015 at 12:17 pm | Reply Dublin Songs and Stories (Part II), September 3rd. | Come here to me! The spelling mistake (urbus) befits neither Library nor populace. It’s been there since 1909 and is now dignified as a century old historical typo. I think it is very exciting and individualistic. Where does the first illustration come from? That has a different spelling again – ‘ubris’.